After Virat Kohli and Anushka Sharma, VJ-turned actor Purab Kohli is giving fans some major relationship goals. Breaking a million of hearts, the 'Rock On' star tied his knot with longtime girlfriend Lucy Paton in a destination wedding in Goa. Purab's 'P.O.W: Bandi Yuddh Ke' co-star Amrita Puri on Thursday took to photo-blogging site Instagram and shared the news of Kohli's nuptials along with a adorable photograph of herself with the groom. "My Sartaj Singh is hitched! Congratulations to my reel life husband! Wishing you all the love in the world @purab_kohli & Lucy Kohli #mandown #sartajsingh #POW," Amrita captioned the picture. Far away from the hustle bustle of Mumbai, the duo decided to get hitched at a private ceremony in Goa. While Purab looks dashing in a beige sherwani, Lucy, dressed in a red lehenga was shinning like a star. The str-studded affair was attended by their close family and friends. Earlier, in 2016, Purab and Lucy signed the legal papers and officially became man and wife. They are also parents to a beautiful baby-girl Inaaya, who holds the flowers as her parents take the wedding vows. 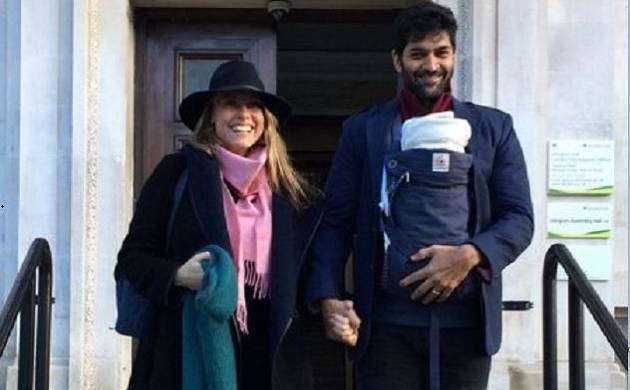 Purab and Lucy had been blessed with Inaaya on December 22, 2015. Talking about her professional front, Lucy is a yoga teacher in UK. "There was pressure to get married. My mother was the most concerned and my family did say 'you guys have to get married quickly' when Lucy was pregnant. But I was adamant about not doing it because I never wanted my baby to feel that we got into a relationship because she was coming. Her coming into this world has transformed both our lives for the better. She is our love child and has bloomed even more love between both of us and made me love life more. I don't want her to ever feel that it was not meant to be. It was meant in every possible way and she was the force of nature and nothing could stop her from coming into this world," Indian Express quoted Purab. Also Read: Virat Kohli, Anushka Sharma to join Karan Johar for a sip of 'Koffee'? Here is the truth! Speaking on fatherhood, Purab told IANS, "Fatherhood is a gift that I wish upon everybody and especially when it's a baby girl. When you have a child, you stop living for yourself. It's the most beautiful feeling."